Pet Care Games Your Pet Will Love! “Here boy! Fetch!” will never lose its luster, but with so much technology and innovation in the world, there are a million ways to play pet care games these days. Whether you’re thrifty and want to craft your pet a new toy (the cat ALWAYS plays with the box), or you want to invest in a robot that slings balls, the following are some interesting pet care games that will keep them rambunctious for hours. The Catnip Yarn-ball: The ultimate DIY cat toy, this activity combines some of their favorite things, and it will keep them entertained for hours. The secret to this simple toy is the wiffle ball inside! The T-Shirt Tug Toy: If your dog rips through toys like there’s no tomorrow, it might be a good idea to save yourself some dough, and use an old T-shirt instead. Just shred the shirt and braid it back together, knotting the end. Now you won’t care how many toys the heathen rips through! There are millions of more DIY ideas for pet toys online, or you can create one yourself. Pets don’t generally care about price tags. In the digital age, people are finding new and innovative ways to toy with their pets. Whether it’s a robot or a laser, technology has come out with some great games to keep your pet engaged. The Laser Pointer: If you have never purchased one of these cheap $1 toys for your cat, you may not know who they really are. You can find these simple cat toys in any local drug store, and they will have your cat literally climbing the walls. It’s great for indoor cats, too, because it guarantees a ton of exercise while they’re still having fun. The Self-Fetcher: Your dog doesn’t have to be a genius to figure this one out. There are many of these toys on the market, but the basic concept consists of an open container in which to put the ball, and a funnel at the bottom that spits it out. Much like that of someone during tennis practice, it offers continuous play for hours. The owner can choose to casually sling the balls at their dog with the robot, or better yet, the dog can teach themselves. This is an amazing toy to keep your dog active, and teach them a new trick. Besides it keeps your hands free to maybe read a book, while your dog entertains itself. Technology is usually a hands-off way of playing with your pet. 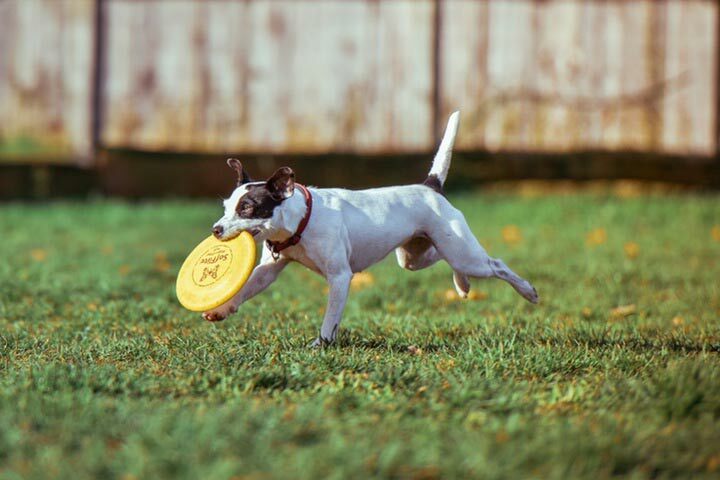 If you’re looking for a little more exercise, you may want to consider another type of game to play with your pet. There are various activities you can also do with your pet that not only keeps their bodies active, but stimulate their brains as well. Training pet care games can be entertaining for both the pet, as well as, the owner. A fun and educational activity for both dog and owner, nose work was inspired by the training done with working detection dogs. It’s an easy to learn activity, that’s meant to build both focus and confidence in dogs. It also trains their senses, and stimulates brain activity. Nose work starts by getting your pup excited about using their nose to find their favorite toy or treat. The game is then expanded across several rooms, outside areas, and even vehicles. Eventually target odors can be introduced, and competition skills can be taught. If cats can be trained to use a toilet, they can be trained to play a game. Cats are much harder to train than dogs, but it can be done. Most cats respond best to a hand clicker, that you use to signal when they have done a trick correctly. Cats can be taught to beg, shake, and even roll over, just like dogs…it just takes a little more patience. Overall, playing with your furry friend can include a variety of pet care games. Depending on your relationship with your pet, as well as their individual personality, they may respond better to some toys, than others. You know your pet best. The most important thing is that no matter what method you choose, you are keeping them engaged and showing your love.